“Edberg and I had a few things in common. We were both reserved, shy, old-school sportsmen. Although Stefan grew up in Sweden, he went against the grain in that clay-court haven and switched to a one-handed backhand, much like I had, because he wanted to play attacking tennis. Edberg was a prodigy, too, but in a slightly different way. He’d won a junior Grand Slam. As a pro, he’d been through something similar to the struggle I was unconsciously dealing with in 1992 – the battle to become a great competitor as well as a great talent. In Stefan’s case, the catchphrase that haunted him wasn’t “ton of bricks” but “fire in the belly”. Early in his career, Stefan was accused of lacking a gut-level, burning desire to win. In a good example of bad timing, I was catching Edberg just as he was proving the critics wrong. The previous year, he had taken over my US Open title with a flawless, artful, straight sets deconstruction of Courier’s straightforward game. Any remaining doubters were convinced by the epic way Edberg went about defending his US title at Flushing Meadows in 1992. In his last three matches before the final, he was down a break in the fifth and final set against high-quality opponents: Richard Krajicek, Ivan Lendl and Michael Chang. The semi against Michael remains one of the all time great matches, in term of the struggles if not the quality of play. Lanky and tall, Edberg was a great mover. He lived and died by his kick serve, which he liked to follow at the net, where he could use his superb volley to cut off all but the sharpest of returns. Stefan’s game plan was straightforward: get to the net. I came out pretty strong and won the first set. But it was a terrible struggle from there. 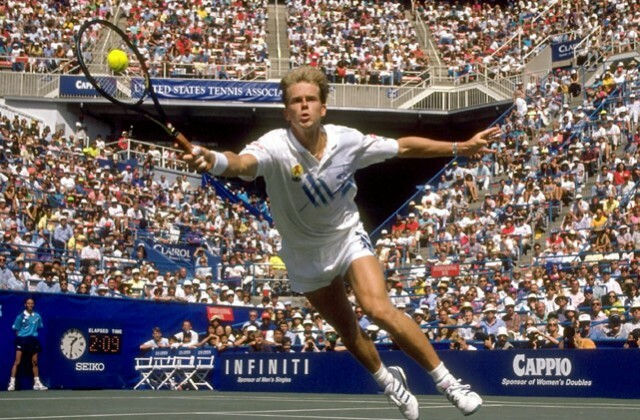 The “new” Stefan Edberg was on full display. He was full of emotion, pumping his fists, yelling, doing everything to show he had fire in his belly. He won the second set.